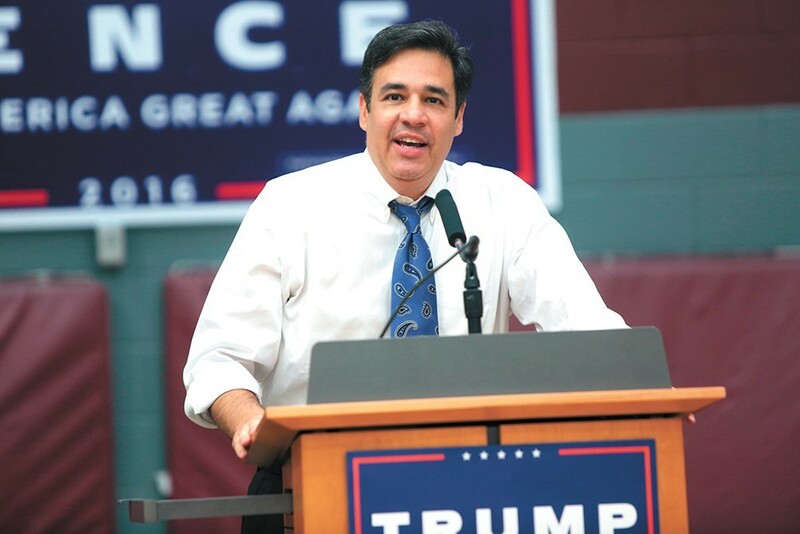 Idaho Rep. Raul Labrador is a big Trump supporter, but he still believes it's the job of Congress to vote on any use of military force overseas — not matter who's president. The Kootenai County Republican Central Committee may have previously narrowly voted to condemn Idaho U.S. senators' support for Russian sanctions — but calling for the U.S. to end its involvement in Yemen was a bridge too far. Last night, libertarian realtor Bjorn Handeen introduced a resolution before the KCRCC calling for the U.S. to stop waging war in Yemen. Handeen argues that U.S. involvement has helped Saudi Arabia carry out atrocities there. But this time, Handeen's resolution was soundly defeated, 29 to 14. If you don't include the proxy votes it was even more a rout, failing 29 to 4. "I think that there was maybe some resolution fatigue," Handeen says. In an email, KCRCC Secretary Alex Barron says that a lot of party members didn't want to try to wade into a complicated foreign policy issue in which they weren't experts. "Precinct Committeewoman Ann Seddon summed up the feelings of a lot of Committeemen when she said, 'My neighbors did not vote for me to come here and debate international military issues that I have no expertise with," Barron writes. He says the committee also voted to communicate that stance clearly to the press. But Handeen argues that, by that metric, there's a lot the Kootenai County Republicans shouldn't be talking about. "If we're going to go down that road, are we going to check credentials surrounding every issue you talk about?" Handeen says. "Do you have to be a health care policy expert to have an opinion on health care?" Barron writes that some committee members also suggested that Saudi Arabia and America's interests may sometimes align. "These are the hard decisions our elected Republican public servants struggle with," he writes. "The Kootenai County Republican Party wanted to ensure that the message is that we support our elected Republican representatives and strongly support our men and women in the armed services." Handeen also received criticism for his resolution on Twitter, where more moderate Idaho Republican Christa Hazel reacted with a face-palm emoji. Barron writes that the committee typically focuses on local and regional issues, though he says committee members can introduce whatever resolutions they want. He celebrates what he calls the "big tent" of the Republican Party, including non-interventionists, economic nationalists, free-trade Republicans, and libertarians. And what about the Russian sanctions resolution, which was about a complicated foreign policy issue? Barron writes for many committee members, saying that resolution was more about the desire to express their "complete frustration with the constant political news cycle suggesting President Trump colluded with the Russian government." Asked if the resolution's failure might have something to do with the fact that would appear to go against Trump's foreign policy, instead of supporting it, Handeen suggested that was very possible. "Holy crap, you’re probably right," Handeen says. "In my floor speech I said, 'We couldn’t depend on the last president to accurately identify America’s enemies. We won't be able to depend on the next president.'" And we won't necessarily be able to depend on this president either, he added. The same day his resolution was defeated, Handeen got a consolation prize of sorts. Idaho U.S. Rep. Raúl Labrador became the third House Republican to co-sponsor a U.S. House resolution to "remove United States Armed Forces from unauthorized hostilities in the Republic of Yemen." It's a rare resolution that puts Labrador on the same side as Seattle Rep. Pramila Jayapal, a liberal Democrat. Labrador's office cites separation-of-power reasons for his support for the resolution: Declaring war on another country should be approved by Congress. "The Resolution is consistent with Congressman Labrador’s long-held view that Congress has a duty to debate and vote to authorize military force whenever our soldiers, sailors, airmen and Marines engage overseas," Labrador spokesman Dan Popkey said in a statement. Handeen, giddy about Labrador's decision, wasn't surprised with the congressman's point of view. "He’s a man who will stand up for the Constitution no matter what," Handeen says.